Chinese Ministry of Commerce spokesman Gao Feng listens to a reporter's question during a press conference at the Ministry of Commerce in Beijing, March 29, 2018. A Chinese government spokesman said Thursday that Beijing "will not bow in the face of threats and blackmail" on the eve of U.S. tariff hikes and will defend its interests. BEIJING — China rejected “threats and blackmail” ahead of a threatened U.S. tariff hike, striking a defiant stance Thursday in a dispute companies worry could flare into a full-blown trade war and chill the global economy. A government spokesman said Beijing will defend itself if President Donald Trump goes ahead Friday with plans to raise duties on $34 billion of Chinese goods in the escalating conflict over technology policy. 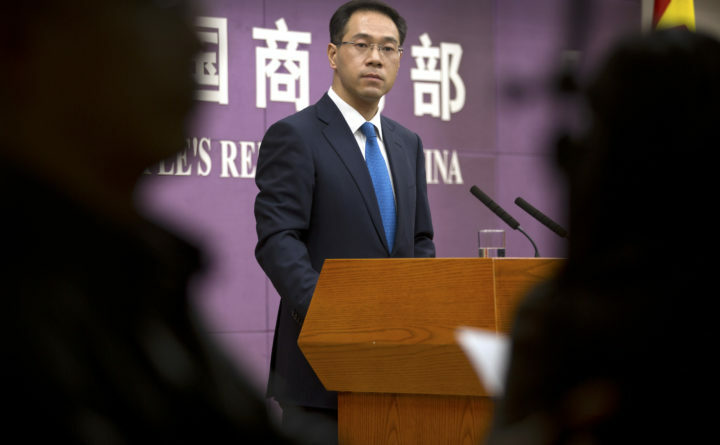 “China will not bow in the face of threats and blackmail, nor will it be shaken in its resolve to defend global free trade,” ministry spokesman Gao Feng said at a news conference. The company wants customers to split the cost of the tariff hike, but few are willing, Tong said. “The global trade conflict is at risk of a serious escalation,” Adam Slater of Oxford Economics said in a report.